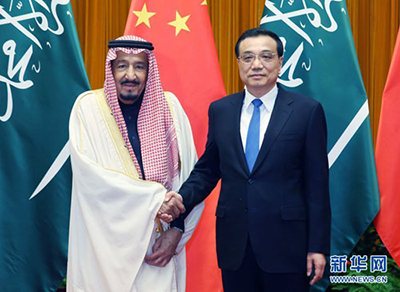 BEIJING, March 17 (Xinhua) -- Chinese Premier Li Keqiang said on Friday that China is ready to work with Saudi Arabia on development strategies and production capacity. Li made the remarks when meeting with Saudi Arabian King Salman bin Abdulaziz Al Saud in Beijing. China respects the right of all countries to choose their own development path according to their national conditions, he said. He said China is willing to work with Saudi Arabia to cement political mutual trust, explore new space for energy and high-tech cooperation, enhance coordination in international and regional affairs, so as to make new progress in the development of bilateral ties. Against the background of uncertainty and instability in the world political and economic situation, China will deepen cooperation with countries including Saudi Arabia to cope with all kinds of risks and challenges, safeguard world peace and security and promote development and cooperation, said the premier. King Salman lauded the long-term friendship and extensive consensus on practical cooperation between the two countries. Saudi Arabia is confident about future cooperation with China and will continue to give full play to the role of the high-level joint committee to enhance bilateral cooperation, said the king. He also called on the two sides to deal with the threats of terrorism and extremist forces, to safeguard regional and world peace and stability. 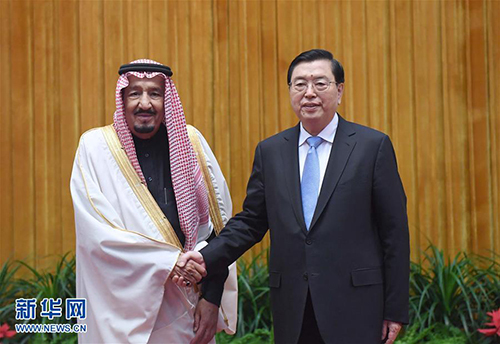 Earlier Friday, Chinese top legislator Zhang Dejiang also met with King Salman at the Great Hall of the People.